Image Size: 23 X 17 in. Artist Morgan Weistling’s portraits of young children are among his most popular paintings with collectors. 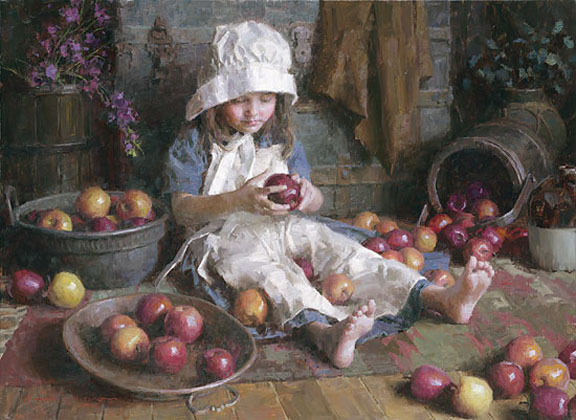 This delicate image of a girl amid a bounty of fall apples, laced with ruby, gold and grey tones, speaks volumes on the inner life of children. The darling kitchen helper, in her bonnet and smock, exudes the wonder of childhood innocence and grace. Just as we all recognize youth’s fleeting nature, all the more fleeting are the moments such as this.